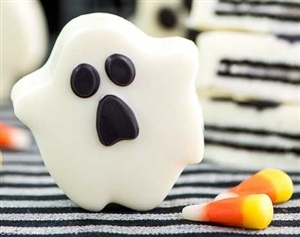 America's favorite cookie meets Halloween. What a perfect combination. Our adorable hand dipped and hand decorated chocolate covered mini Oreo cookies come individually wrapped or bulk bagged. Made only with white chocolate. Ghost is 1.5".